Rate categories and overrides are here! We've added significant functionality to the rate engine, based mostly on your feedback. You can now specify a rate for weekends, specify the number of nights that a week or weekend has and define the day types (Sunday, Monday, Tuesday, etc) that are valid for a category. 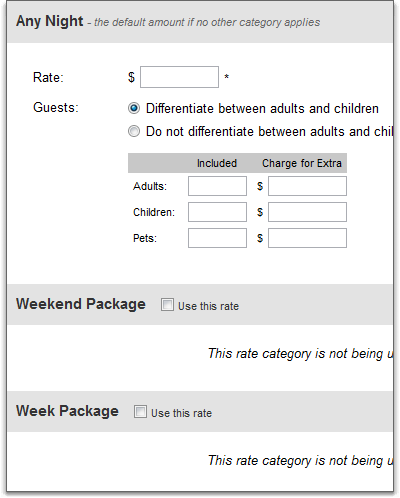 You can also choose not to split up adults and children - charging only for a total number of guests. To see the changes, navigate to your property and click the Rate link. You'll notice a new page layout that shows the default rate at the top and the override rates at the bottom. The "default rate" is the rate that is used most of the time. Think of it this way - if no override rate has been specified for the dates in question - the dates of the booking or quote - the default rate will be used. We'll get into the overrides in a later post. For now, click the Change button to drill into the default rate. You'll see a completely new page layout with six rate categories that can be filled out. The only category that is required is Any Night because there must be some basic 'per night' charge that is used if no other category is met for a given date. As you will see, all other categories are unused until you specifically mark them as used by selecting the Use This Rate option. Once selected, the rate will open so that can fill in the rest of the details for that category. As you'll notice, every category has the same basic options with a few additions. First, each category asks what the rate amount should be for that category. You should enter the entire amount that should be charged for the entire category. For example, if the category is week, enter an amount that encompasses all 6 or 7 days for that week, not just 1 night. The other thing that every category has is the Guests breakdown. The Guests breakdown allows you to specify what kind guests are included for the specified rate and how much more is charged for extra guests. 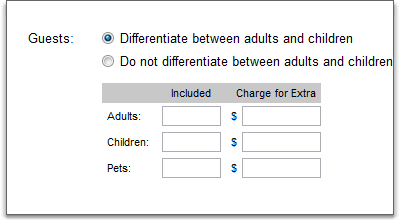 If you charge only for total guests (instead of a adult/child breakdown), select the "Do not differentiate between adults and children" option which will change the display. If you do not specify a value for one of the Included text boxes, that is interpreted as allowing an unlimited number when calculating the total rate. If you charge extra for all guests, you would need to put "0" in the Included text box. All categories, except the Any Night category, include a Valid Days field which allows you to select which days of the week participate in the category. This allows you to specify when, during the week, the category is active. For instance, the Weekend Package category is usually only used on Friday, Saturday and Sunday night. If a guest requests 3 nights during the middle of the week, you may not want to give them a weekend-specific rate just because the number of nights is the same. The Valid Days field is interpreted by the rate engine inclusively, as opposed to exclusively. This means that if any one of the selected days of the week is in the requested dates, the category is valid. If you want any day of the week to be valid, select all of them. The Week and Weekend Package categories also include a Nights field which allows you to specify the number of nights that are part of that category. For example, some owners prefer using a 6 night week; others prefer a 7 night week. 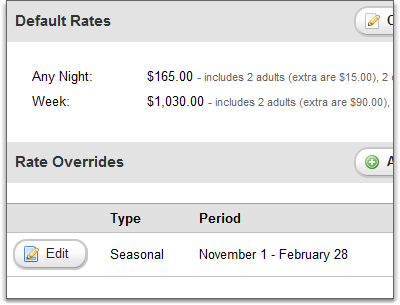 Next time, we'll discuss the overrides and how to use the above options for a specific season or set of dates.